The following is excerpted from an article released October 22 by Crowley. The complete article is available online. American Maritime Officers represents all licensed officers aboard the Commitment Class ships. 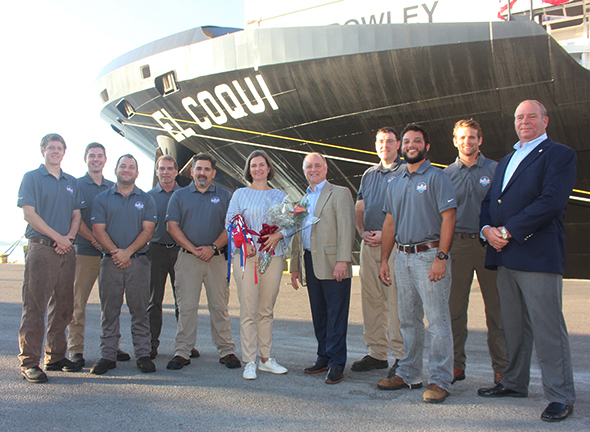 Crowley Maritime Corp. on Saturday christened its Commitment Class combination container/roll on-roll off ship El Coquí, which is among the first of its kind to be powered by liquefied natural gas (LNG). The ship is a key new component in Crowley's supply chain transformation in the U.S. mainland-Puerto Rico trade. A crowd of more than 400 people, including White House officials; U.S. congressional members; local officials; representatives from ship builder, VT Halter Marine, and Eagle LNG joined Crowley employees, vessel crew members and other industry and union representatives to celebrate this milestone. As shown in this video, Crowley Board of Directors Member Christine Crowley, spouse of Chairman and CEO Tom Crowley, served as sponsor performing the time-honored tradition of breaking a champagne bottle over the hull of the 720-foot vessel at the JAXPORT Cruise Terminal in Jacksonville, Fla.
"It's a culmination of many, many years of hard work, many, many years of transition for this company," said Chairman and CEO Tom Crowley, who applauded the company's employees and partners for their success designing, constructing and operating the ship. "It's remarkable to see the transition. Whether it's going from Ro/Ro to Lo/Lo, the LNG fuel, putting a car house on the back of a container ship, you name it, you go through the transition of what we did to build a ship and create a supply chain that nobody else can match. And it's here today," continued Crowley. El Coquí, which arrived in San Juan on her maiden voyage July 30, is 219.5 meters (720 feet), 26,500 deadweight tons (DWT), and able to transport up to 2,400 twenty-foot-equivalent container units (TEUs) at a cruising speed of 22 knots. The ship can accommodate containers in a wide range of sizes and types - including 53-foot by 102-inch-wide, high-capacity containers and refrigerated containers. Within the ship is an enclosed, ventilated and weather-tight Ro/Ro deck that can protectively carry cars and larger vehicles. This type of shipboard garage is offered exclusively by Crowley in the trade, enhancing supply chain solutions for customers. The ship is the first of two vessels built as part of Crowley's Commitment Class project. Her sister ship Taíno is in the final phases of construction and testing at VT Halter Marine's shipyard in Pascagoula, Miss. She is expected to be delivered later this year. "El Coquí represents not just the $3 billion investment that Crowley has made in this industry in recent years, it really is the future of the maritime industry itself," Gray said. "The vessel is powered by liquefied natural gas - it's the cleanest fossil fuel available. It will serve as a shining example of the technological innovation that's going to allow this industry to remain a global leader for decades to come." The Jones Act ships are U.S.-built, owned and crewed. They are part of Crowley's $550 million investment under the Commitment Class project, modernizing its supply chain solutions serving diverse customer needs in Puerto Rico, including three new gantry cranes; a new 900-foot pier; and an enhanced terminal operating system at the Isla Grande Terminal in San Juan. In Jacksonville, Crowley partner Eagle LNG constructed an LNG bunker fuel station to fuel the new ships that is among the first of its kind, too. "Many people may talk about amending the Jones Act or taking it away, but they're not living on the island," said Rep. González-Colón. "And they don't need that supply on a daily basis, on a weekly basis, and have it reliable like we receive it today - and that's the reason I support the Jones Act."